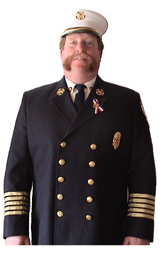 AMTEC founder Rick Crocker is a veteran of over twenty five years fire department service, including eight years as Chief in Amherst, New Hampshire. Rick has provided training, testing and consulting services to the food, petrochemical and paper industries, as well as colleges and universities, resorts and multiple residence housing complexes. His experience and knowledge is passed along in training seminars and videos produced by AMTEC to insure that fire suppression systems (sprinklers) can be relied upon in an emergency.